The Center for Disease Control (CDC) has released voluntary guidelines for schools and education programs on how to manage students' food allergies. In 2006, about 88% of schools had one or more students with a food allergy. Studies show that 16%-18% of children with food allergies have had a reaction from accidentally eating food allergens while at school. In addition, 25% of the severe and potentially life-threatening reactions (anaphylaxis) reported at schools happened in children with no previous diagnosis of food allergy. Until now, no national guidelines had been developed to help schools and early care and education programs address the needs of the growing numbers of children with food allergies. However, 14 states and many school districts have formal policies or guidelines to improve the management of food allergies in schools. Food allergies affect an estimated 4%-6% of U.S. children, most of whom attend federal- and state- supported schools or early care and education programs every weekday. Allergic reactions can be life threatening and have far-reaching effects on children and their families, as well as on the schools or early care and education programs they attend. In 2011, Congress passed the FDA Food Safety Modernization Act to improve food safety in the United States by shifting the focus from response to prevention. Section 112 of the act calls for the Secretary of U.S. Department of Health and Human Services, in consultation with the Secretary of the U.S. Department of Education, to develop voluntary guidelines for schools and early childhood education programs to help them manage the risk of food allergies and severe allergic reactions in children. 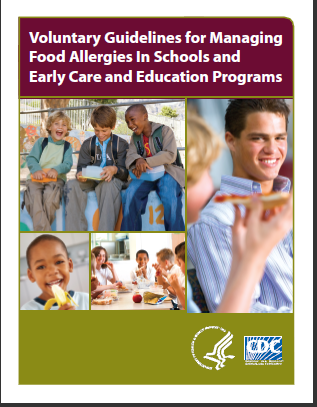 In response, the Centers for Disease Control and Prevention of the U.S. Department of Health and Human Services, in consultation with the U.S. Department of Education, developed the Voluntary Guidelines for Managing Food Allergies in Schools and Early Care and Education Programs. Some children with food allergies face health challenges that can affect their ability to learn and their social and emotional development -- and even pose a daily threat to their ability to live productive lives. These guidelines call for strong partnerships among families, medical providers and staff in schools and early care and education programs to help children overcome the challenges that come from having a food allergy. These guidelines also call for strong leadership in schools and early care and education programs, comprehensive plans for protecting children with food allergies, and effective responses to food allergy emergencies. There is no cure for food allergies. However, staff in schools and early care and education programs can take concrete actions to protect children with food allergies when they are not in the direct care of the parents or family members. When schools and early care and education programs develop and implement plans to effectively manage the risk of food allergies, they help keep children safe and remove one more health barrier that keeps some children from reaching their full potential.